Free Version to test on live market before buying. Free Version works only for EURUSD orders. Shows Risk, Reward & Trailed position monetary value along with risk-reward ratio for all active open orders & total position. Here locked profit represents trailed positions. Indicator counts order commission & swap charges into the calculation to show the actual monetary value of a trade. If any order doesn't have any stop loss, then it shows the active risk value. Indicator dashboard layout improved with better visual. 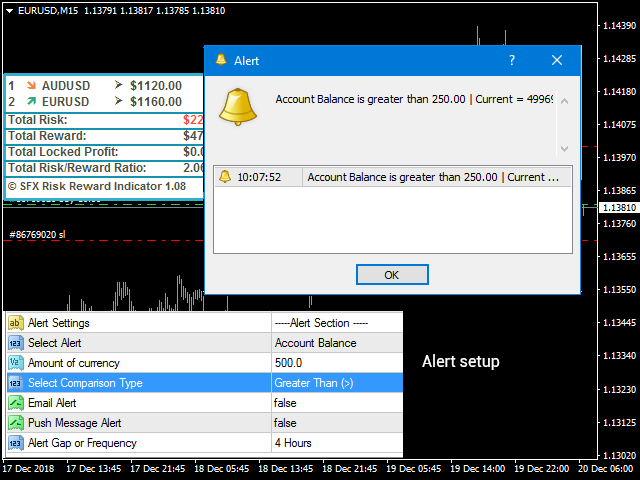 3 types of alert added for Account Balance, Total Risk & Total Trailed or locked profit. Calculation improved with swap & trade commission. Shows actual Risk-Reward Ratio after all cost. Indicator Layout Improved for better visibility & Understanding. Risk Reward Ratio added for both individual trades & total positions. A major bug got fixed with deleting objects. X,Y position option added for customizing indicator position according to user needs. New Symbol added to better visualization. - Minor tooltip bug fixed.